Want to be a Minion? Are you sending a gift for that special someone? Don’t forget to have our minions wrap it all up with a beautiful bow. Acrylic, or poly(methyl methacrylate), was invented in 1928 and first marketed in 1933 as safety glass thanks to its shatter resistant nature. Since its inception Methacrylate has been synthesized in about a dozen different methods leading to twice that many trademarked names for poly(methyl methacrylate). Names like Lucite, Plexiglass, ACRYLITE, and Perspex are all essentially the exact same thing with some very minor differences due in part to how the methacrylate was produced. 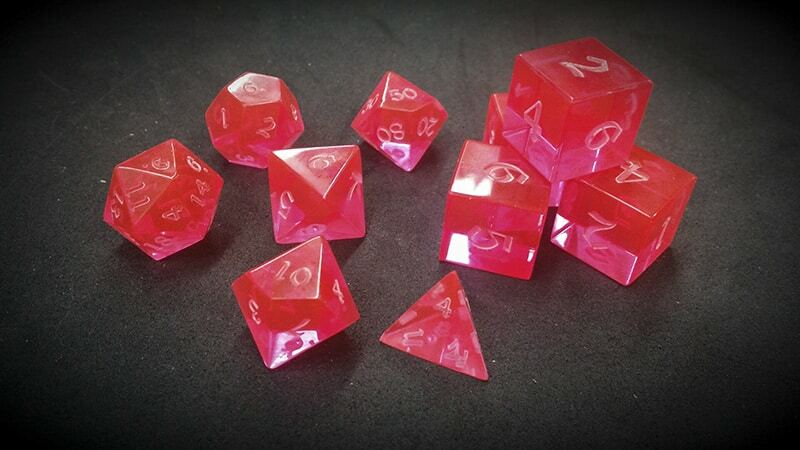 The PMMA we use in crafting our Alchemist’s Dice is manufactured by Lucite. Acrylic’s are used in many applications from aquariums, to helmet visors, and even bulletproof body panels for armored vehicle. It’s also used for aircraft canopies and in making ballistic glass. Depending on the application, acrylic is either produced in a casting process or it is extruded, as is the case with the acrylic beads used in injection molding. We chose cast acrylic rod as our base material over, the much less expensive, extruded acrylic as the casting process gives us a significantly increased optical clarity. 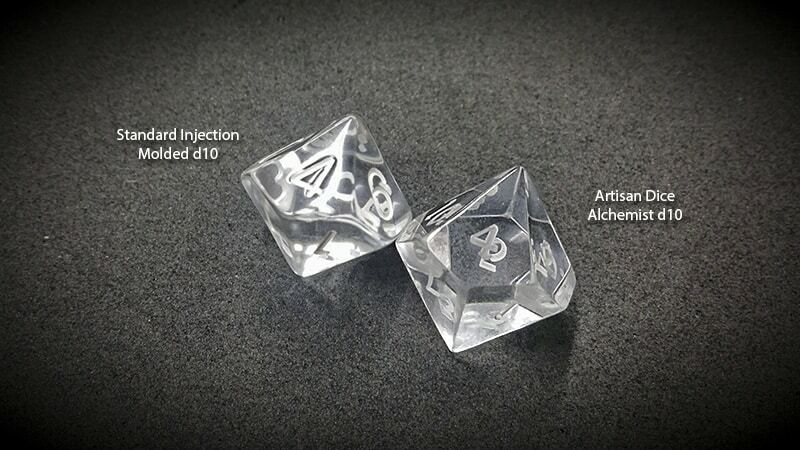 Each of our Acrylic dice are individually machined and the polished in 5 stages to bring back the optimal clarity and luster inherent to cast acrylic. This process is labor intensive but as you can see in the image to the right, it produces far superior results to injection molded acrylic dice. PLEASE NOTE: We no longer use laser cut acrylic boxes, all of our dice have been upgraded to include our standard box as chosen above. 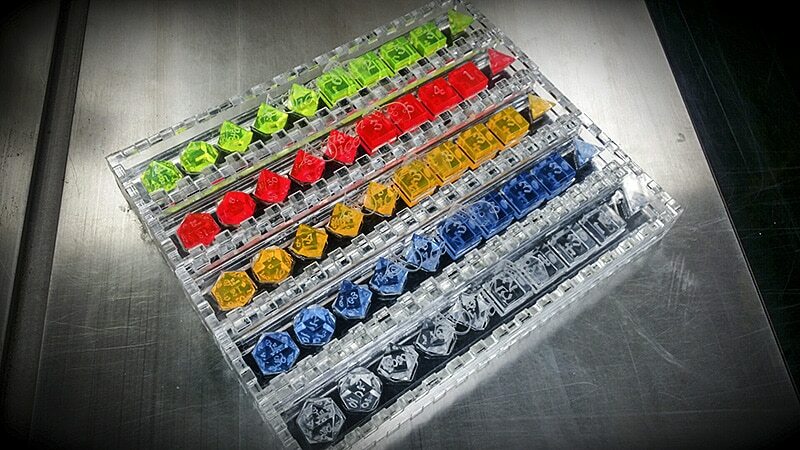 After having made your selection above, please choose the die/dice that you would like to have customize. For instance, if ordering a Full Polyhedral Set, you may have the entire set customized, just the d20, or only the six sided dice. Please note this option will set the price for Engraving options and Embellishments. We offer 2 styles of engraving. Our standard engraving style burns the outline of the number on each face. This outline style of engraving works well with our Infill technique of Embellishment, and is great for adding a splash of cost effective color to your chosen dice. The second style of engraving we offer is a Raster Engraving style. This process burns solid numbers into each face of the dice and works very well with our Inlay techniques of Embellishment, which allows us to make use of real metal alloys and crush semiprecious stones. If you'd like to have your dice engraved in a custom font please upload your chosen font in True Type Font format (*.ttf). We will not accept any custom engraving work for copyright materials. Yes this means things like Aurebesh and Klingon are off limits. I think the third line should read “4 Fudge Dice @ $49.00” (instead of “4 Assorted d20s @ $49.00”). These have got to be black light reactive, right?